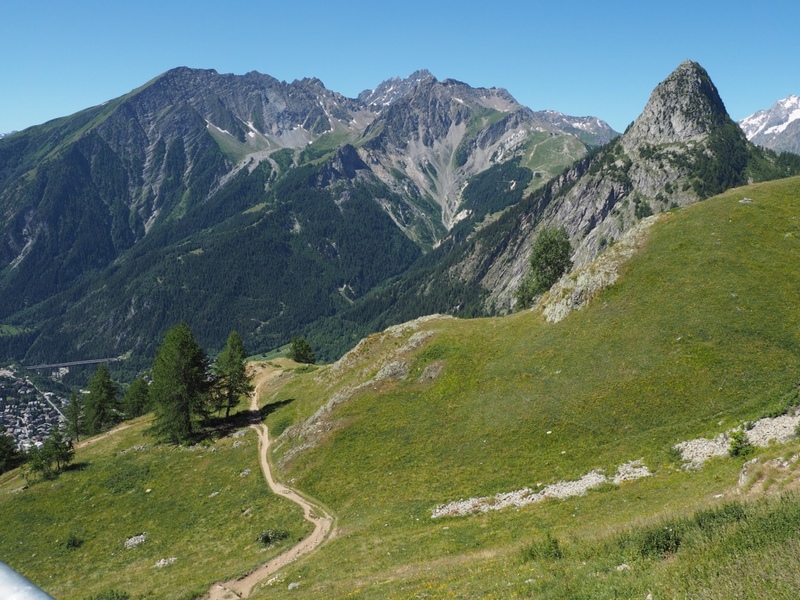 Look to the left for a slice of Courmayeur on the left after our climb. 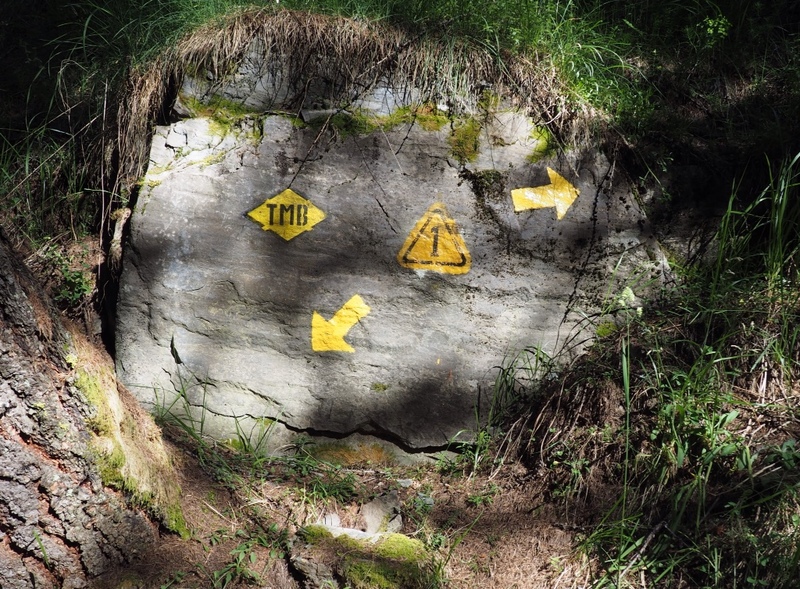 The TMB is clearly marked in Italy. It was not so well marked in France. It was “ciao” to Courmayeur, Italy today after a day of rest in the Alps resort city. 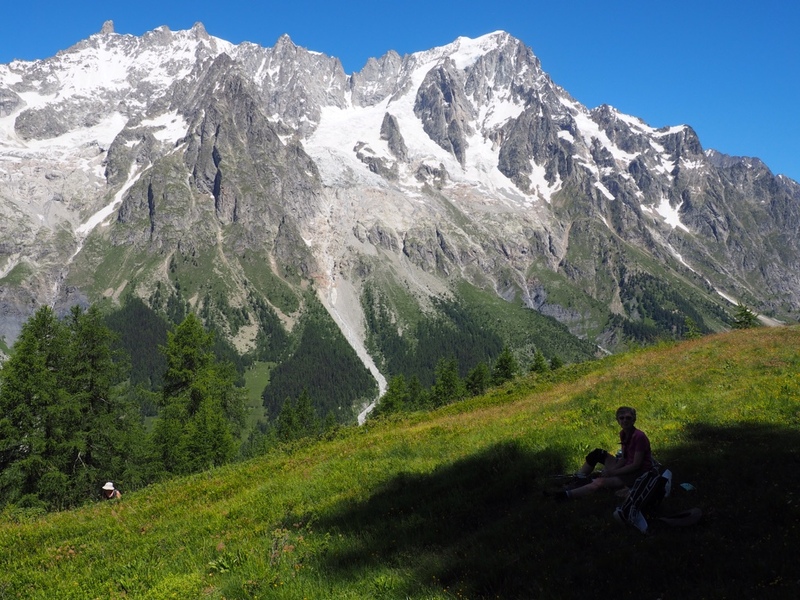 The Tour du Mont Blanc has been more than challenging for us, so we needed the break. Walking into a new country was a new experience on Saturday. 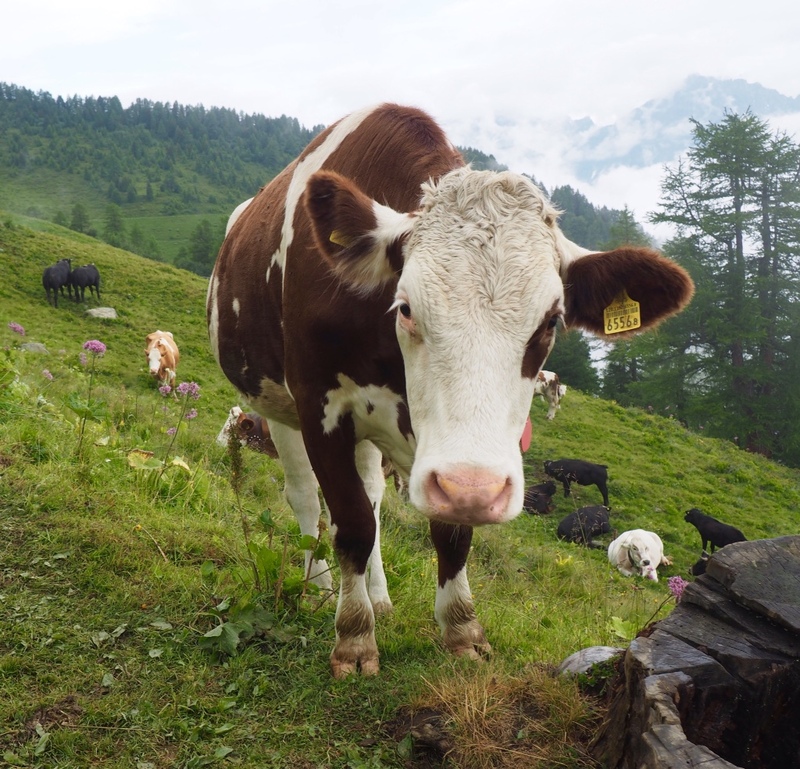 We heard “buon giorno” more often than “bonjour” almost immediately and by the time we walked into Courmayeur, it was clear we were no longer in France. We will leave the specific cultural differences for another time, but we noticed them in the city and most definitely along the trail. 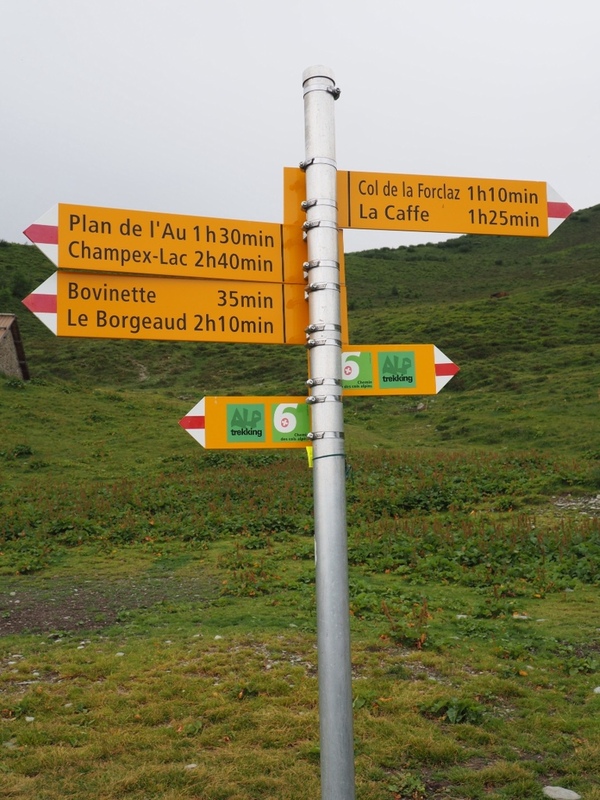 Of course, today started with a steep, 2,500-foot climb, but after that it was the easiest hiking day of the Tour so far. 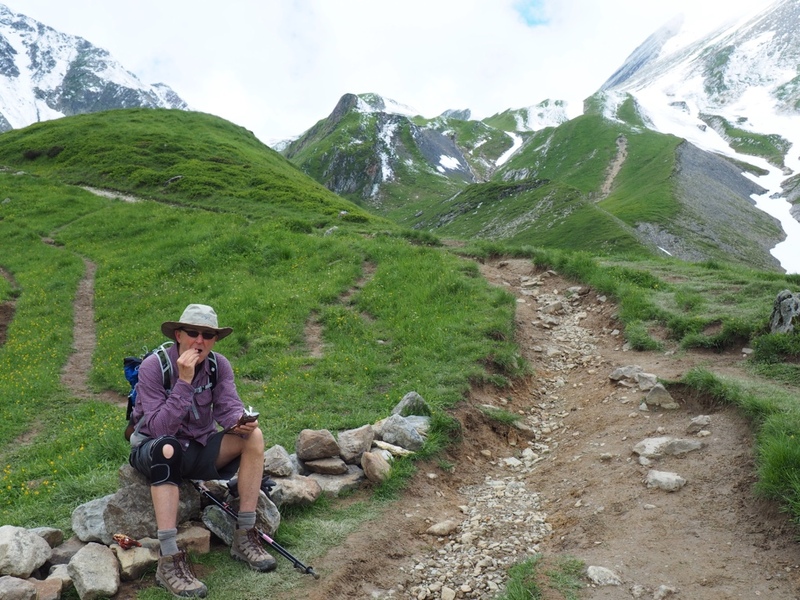 We walked about ten miles at 6,500 feet overlooking a steep glacial valley. The Mont Blanc range on the other side seemed close enough to touch. It was stunningly beautiful. After a steep descent, we found our hotel in another resort town, Levechy, next to a roaring river at the foot of the Alps. A shower and a beer on the deck made for a perfect cap to the day. Dinner tonight in the hotel, part of the package deal. 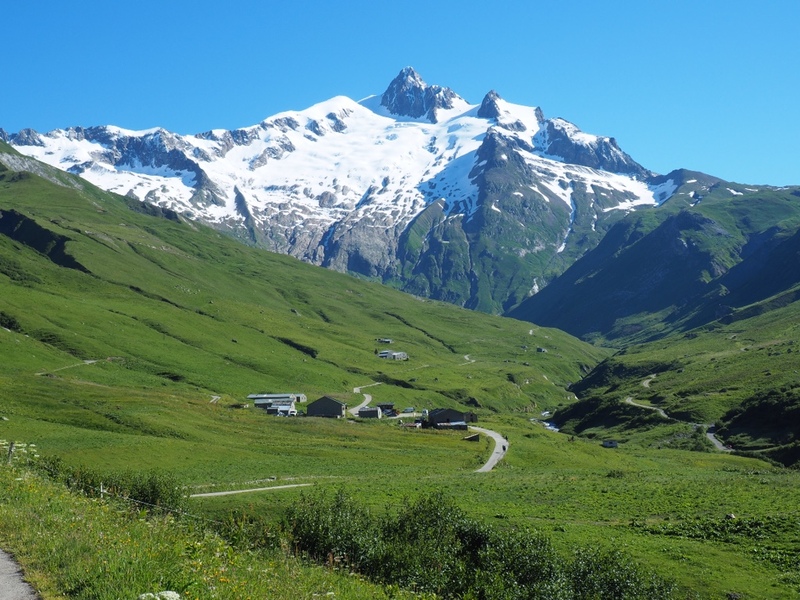 The warm weather is supposed to hold for at least another day and the guide book says we will have another amazing look at the Tour's namesake as we cross into Switzerland at 8,000 feet tomorrow. That means another steep climb and “ciao” to Italy for now. We will return! 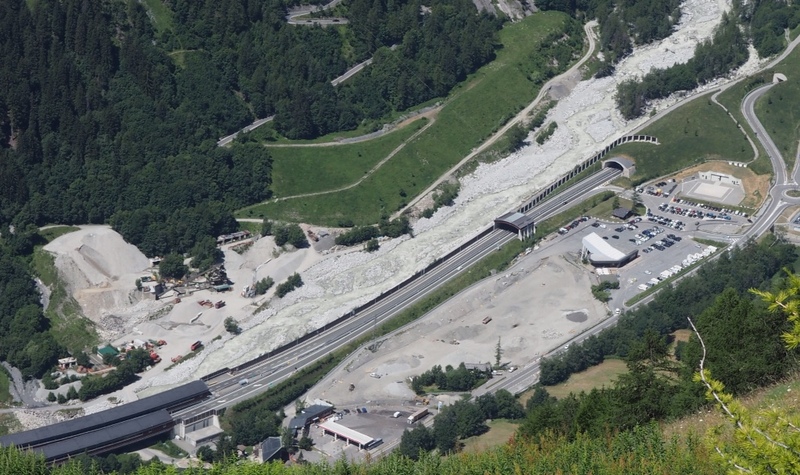 At the bottom of the Italian side of the Alps, if you look closely, is the tunnel entrance. The road goes under Mont Blanc and comes out in Chamonix, France. This is a closer look at the tunnel entrance. Sue sits in our shady picnic spot next to the trail. The Mont Blanc range was in the perfect spot. This was the TMB for much of the day. Few rocks, relatively flat. The first day we have seen such a path on this trek. 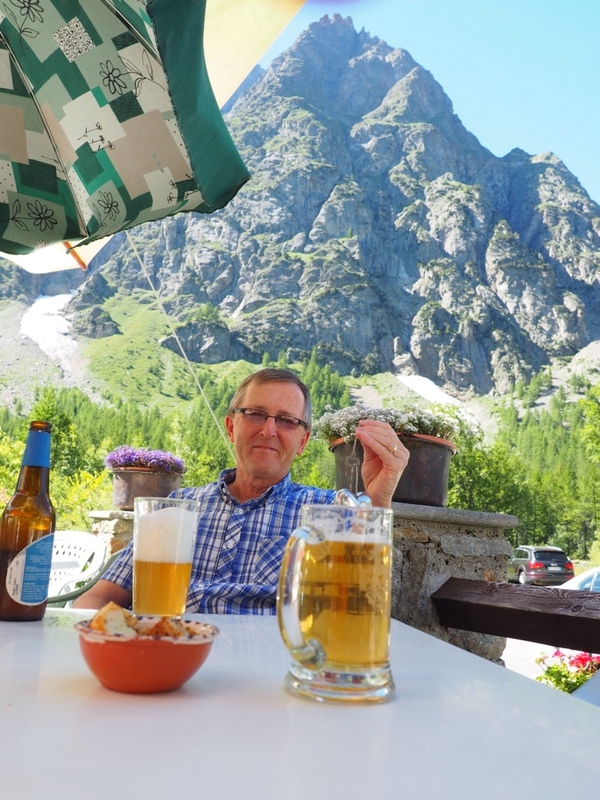 Is it the view or the beer that makes the trek worthwhile? Thank you, Silvia, at Follow the Camino tour company, for finding us lodging here. Refugios have been so welcoming, allowing us to have our picnic even though we only bought a coffee at their bar. 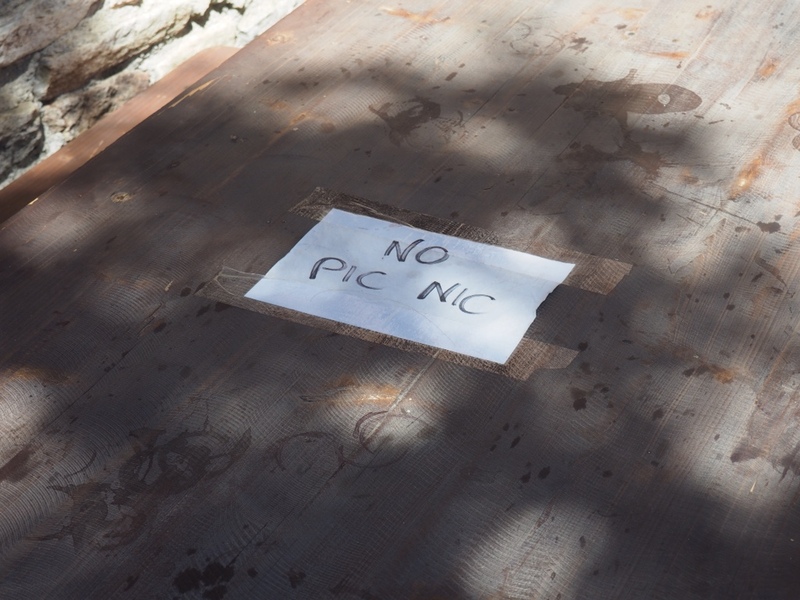 Today, we found one with a most unwelcoming message in each table. We found a warmer place for lunch. 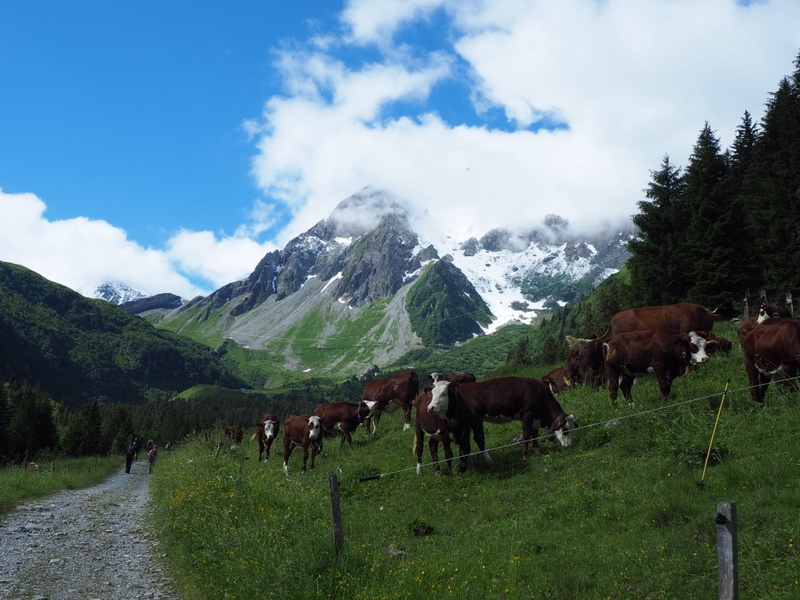 It was pastoral calm as we began the third day of the Tour du Mont Blanc. We had a quick snack before heading into the snow zone. We planned for lunch in a bit, but it never happened. Ah, a little snow at the col looks fun. At the top, all changed quickly. A late winter and snow just last week has made July feel like anything but summer. From my bottom bunk looking out a small window in a wood-paneled room, I see a glacier and Alpine peaks high above. 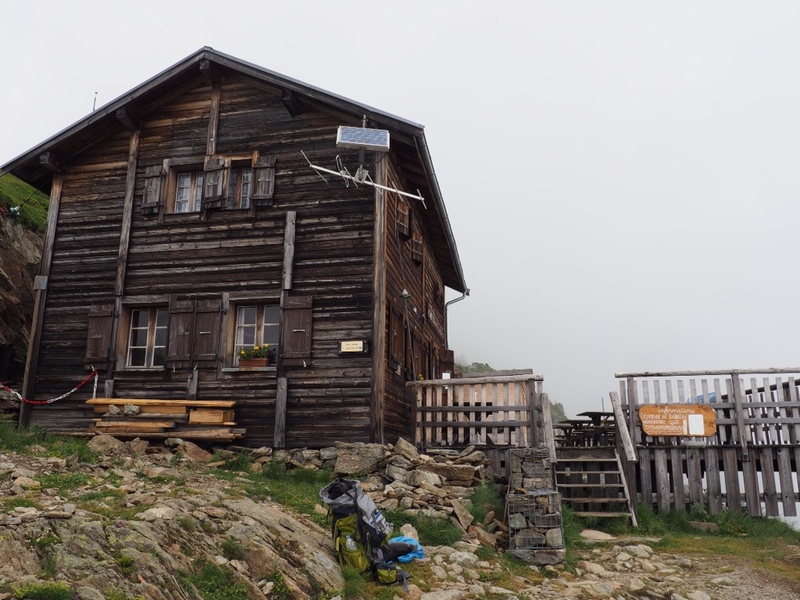 Our home for tonight, the Elizabetta hut in Italy, is at about 7,500 feet, two miles from the Italy-France border. 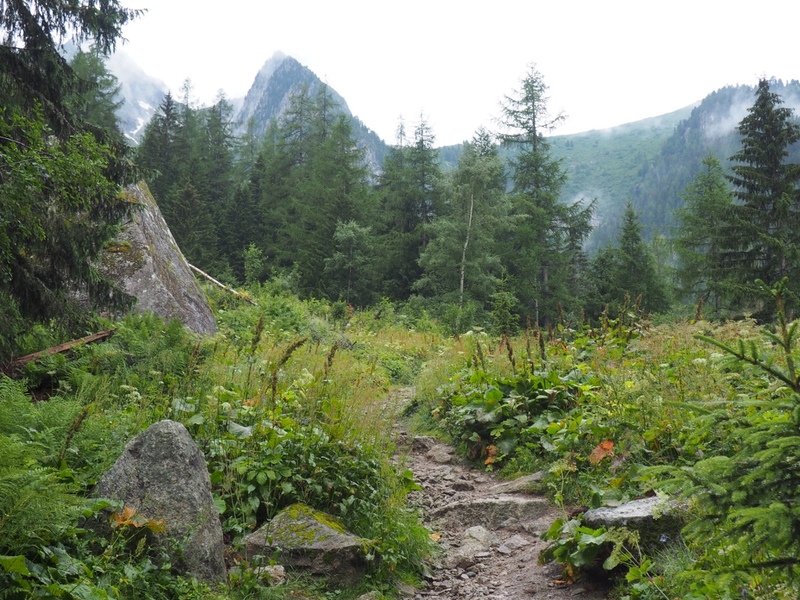 The only way we could get to this place, as remote as you can get on the Tour du Mont Blanc, is by walking. Sue and I are in day four of the Tour. Day three was beautiful, grueling, treacherous and much more. More than 8,000 feet in elevation change hardly tells the story. 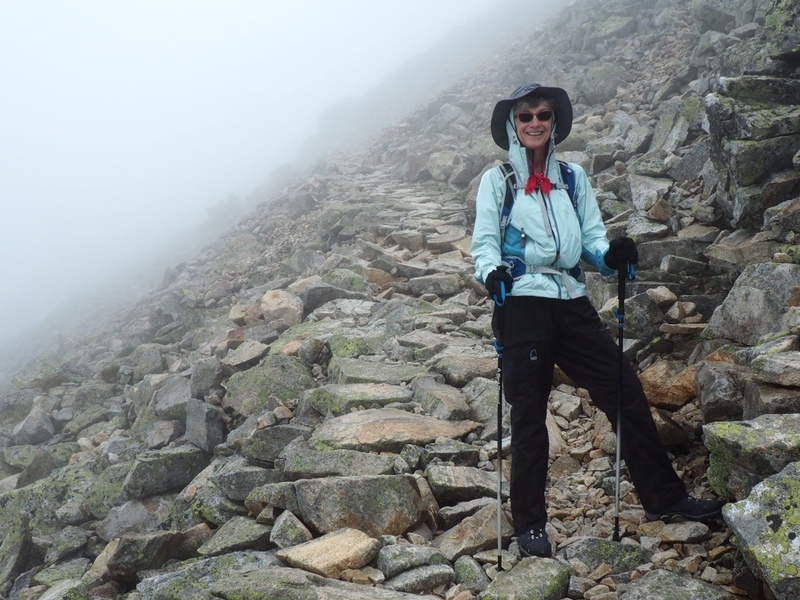 After we had climbed for four hours and 4,000 difficult feet up on Friday, we reached the col (pass) at 8,100 feet, thinking we had 3,000 feet downhill to our refuge, or hostel. I looked up and could make out moving figures far above, climbing through the snow to another pass. “I am so glad we don't have to do that,” I thought. Think again. Two hours later, we had endured slippery snow banks and rocky passages, and were so exhausted that taking photographs was just too much. There were moments when we wondered why we were here. 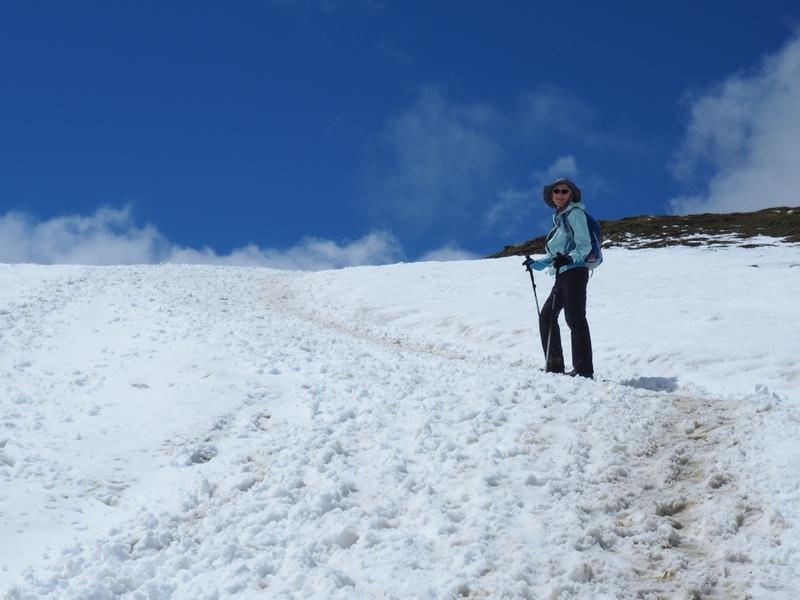 Today, we had four hours of steep climbing, but very little snow. 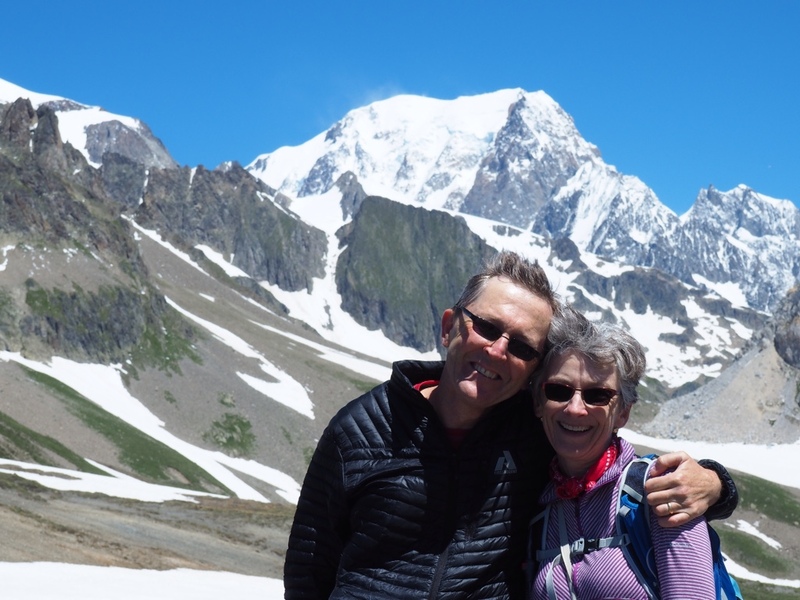 It took us to an 8,200-foot col, at the Italy-France border, and as we arrived, so did our view of Mont Blanc, at 15,770 feet. It appeared close enough to touch, outlined by brilliant blue sky. While eating our picnic lunch, it was crystal-clear why we were here. Reg heads up, toward the second col. The conditions got much worse and the camera took a break while we focused on making it to the top. Day four started after a night at a remote refugio at about 5,000 feet. 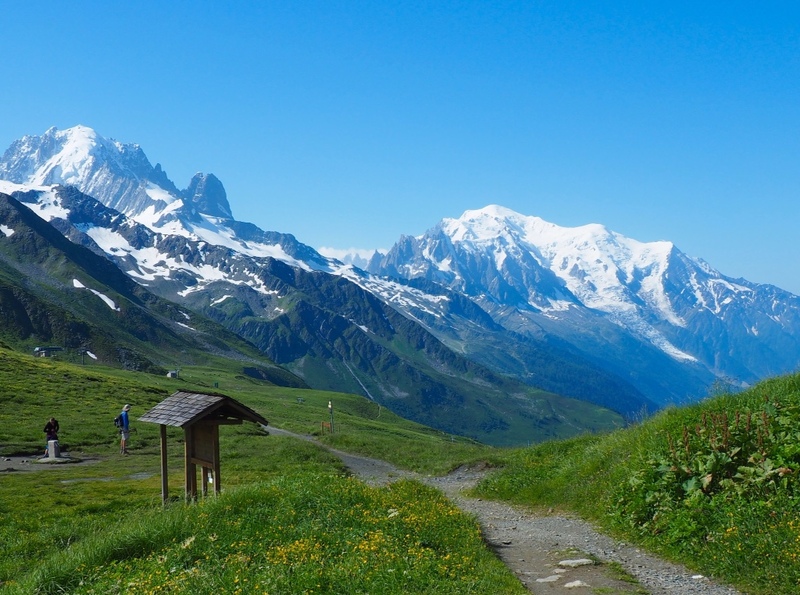 We were awe-struck at our introduction to Mont Blanc. We are about halfway to the top of the 15,770-foot mountain. It looked much more imposing in person. 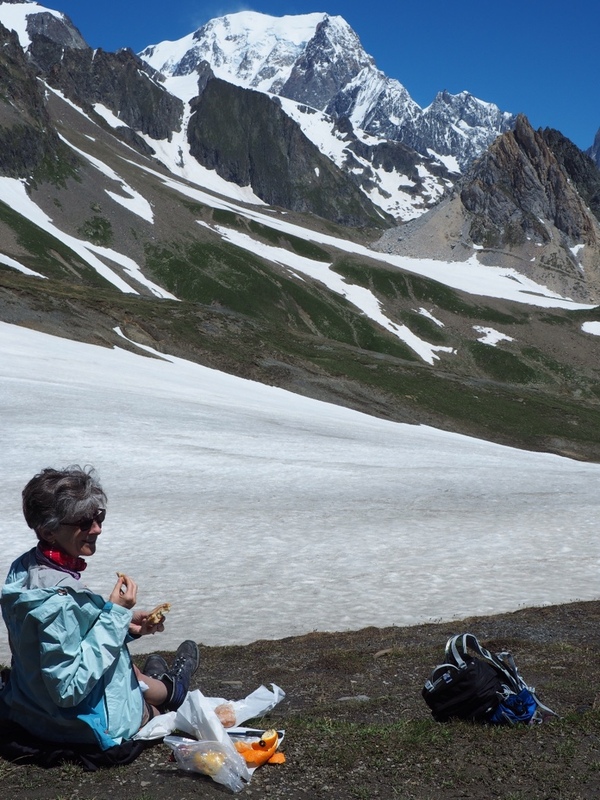 A baguette, cheese and Mont Blanc made a perfect picnic combination. 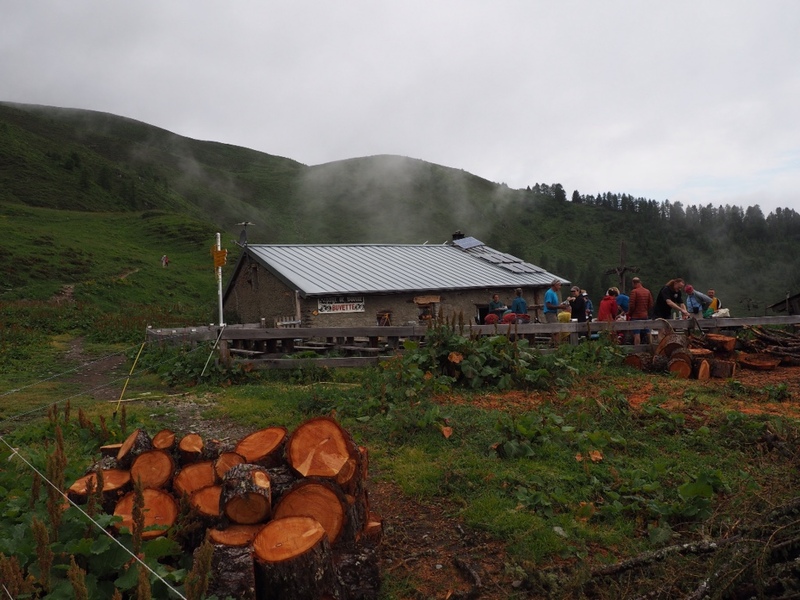 Refugio Elizabetta is a rustic remote outpost on the Tour. Trekkers are packed into the small building, with triple bunks and single mattresses pushed right up against each other. We lucked out with a private room. 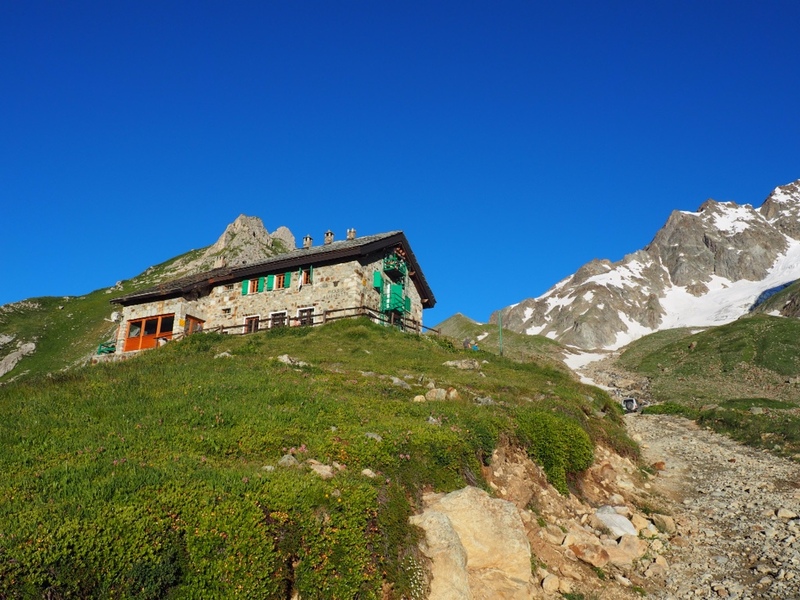 Refugio Elizabetta is nearly lost in the Alpine landscape in the photo above. The Elizabetta offered rustic accommodations, but a good, three-course evening meal. About a third of the way down, a view of the valley peeks through. 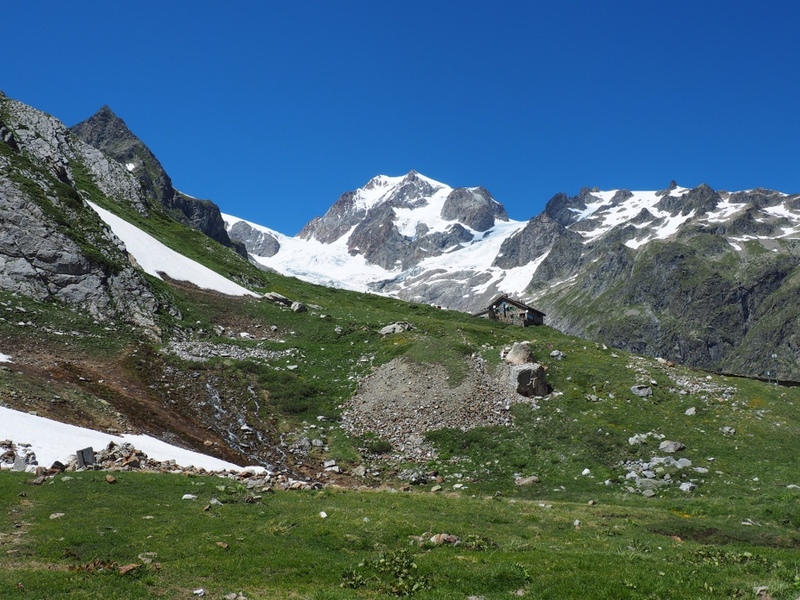 We will be walking the 110 miles of the Tour du Mont Blanc over the next two weeks, with a couple of breaks. 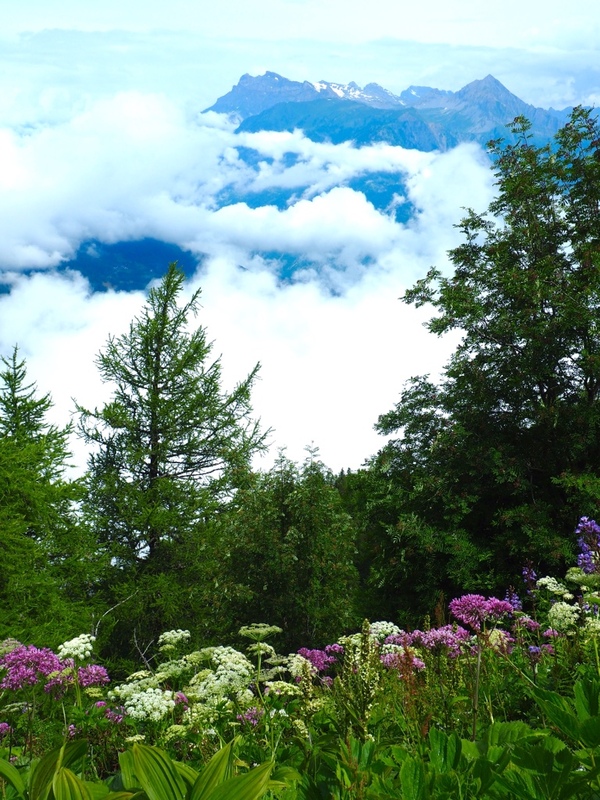 The trek circles Europe's highest peak, which is really a mountain range of Alpine peaks, above 15,000 feet. We are starting in France and will go counter clockwise through Italy and Switzerland, finishing where we started in Chamonix, France. There will be about 68,000 feet of elevation change. 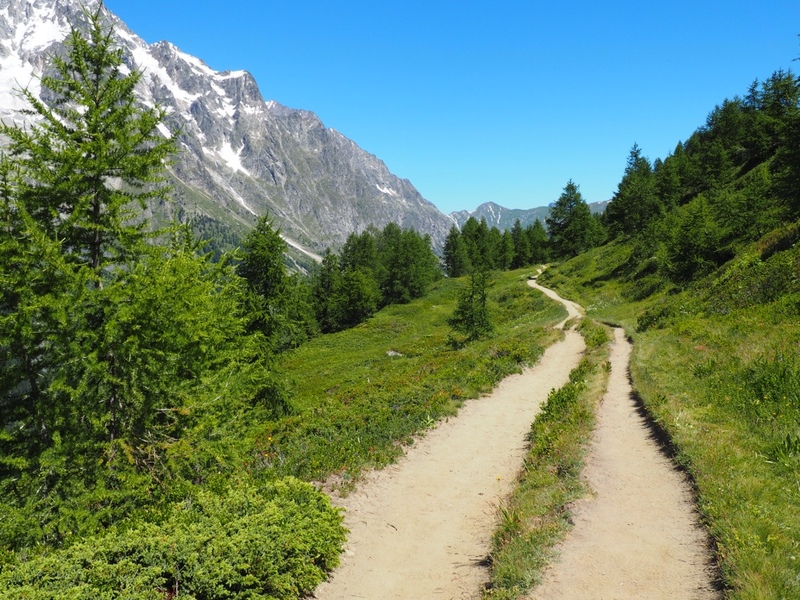 It is Europe's most popular long-distance trek. The clouds have parted a couple times to give us a look at the spectacular mountains that rise above the charming towns below. We are looking forward to the views as the weather brightens over the next few days! This hut about a third of the way down was our lunch stop. Rustic, to say the least, perched on a cliff, great coffee! Chains provided a security blanket at a couple of places. 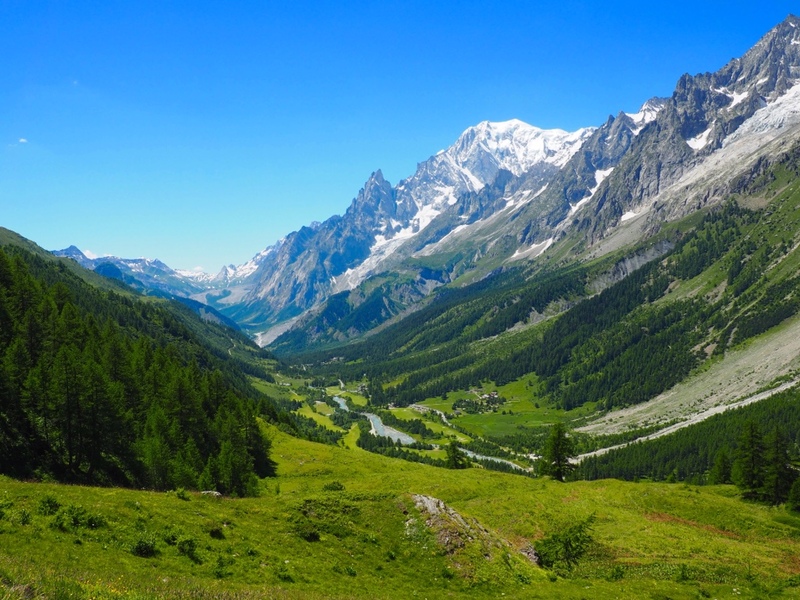 On a clear day, you could see 5,000 feet down to Chamonix and across the valley to Mont Blanc, at more than 15,000 feet. Clearing weather is in the forecast! At times today, it felt like we were walking in the jet stream. 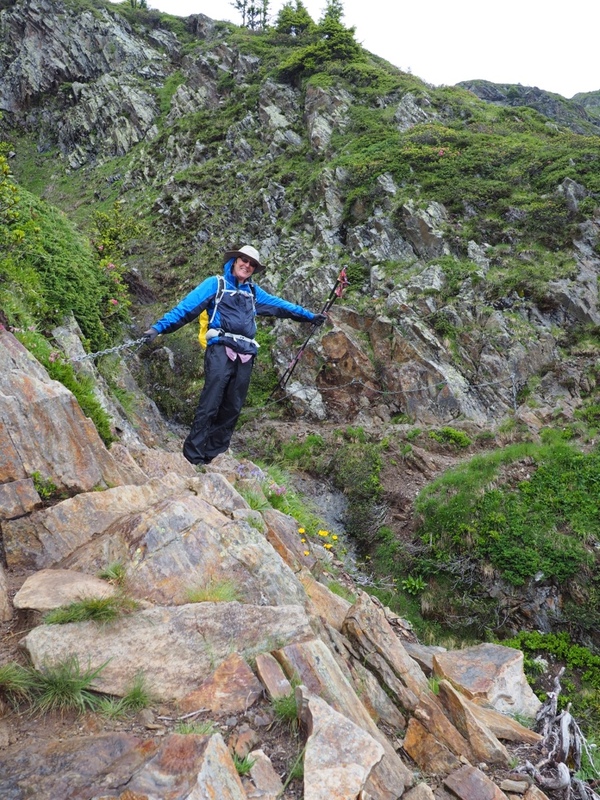 Sue begins our trek down from Le Brévant. 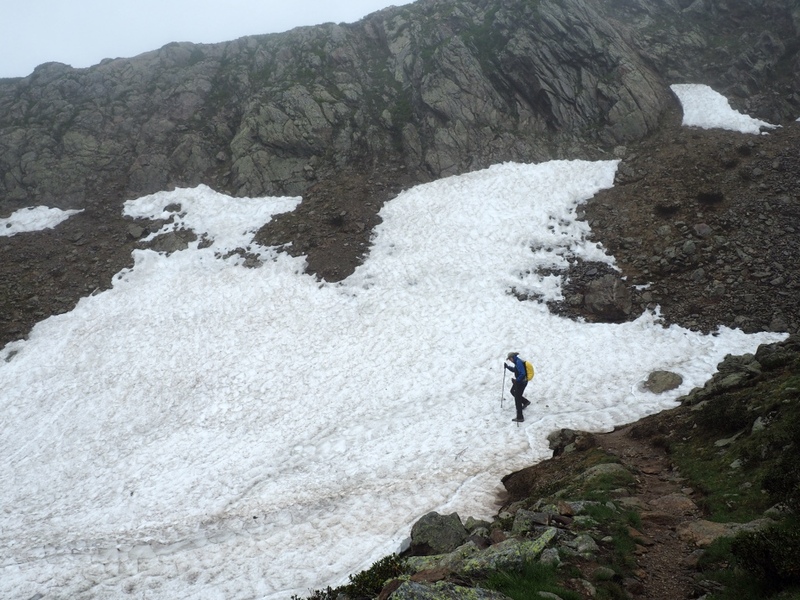 Reg takes it slow and easy across a snow field at about 8,000 feet. 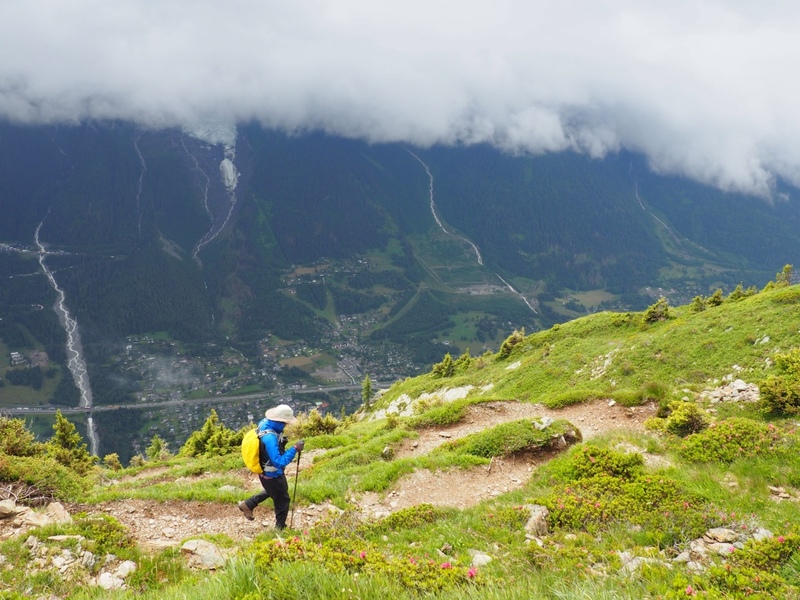 We were strongly advised to begin our trek with two gondola rides from Chamonix, taking us more than 5,000 feet up above spectacular terrain to Le Brevant, more than 8,000 feet high. Clouds blocked our view across the valley to Mont Blanc and made visibility poor for most of the day. 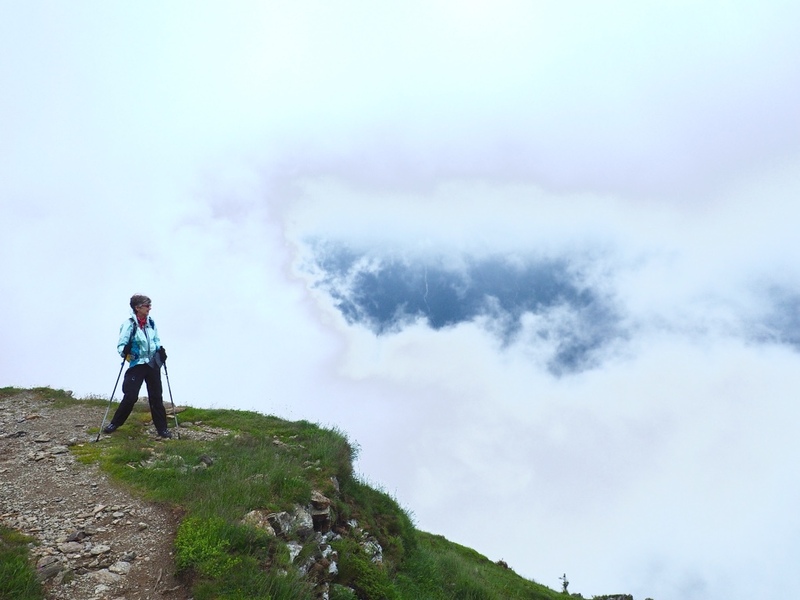 So, after ascending into the clouds, all we had to do is walk to Les Houtches, about 10 miles away, but more than a mile below. It is impossible to describe how challenging, exciting, tiring, painful, and wonderful it was. 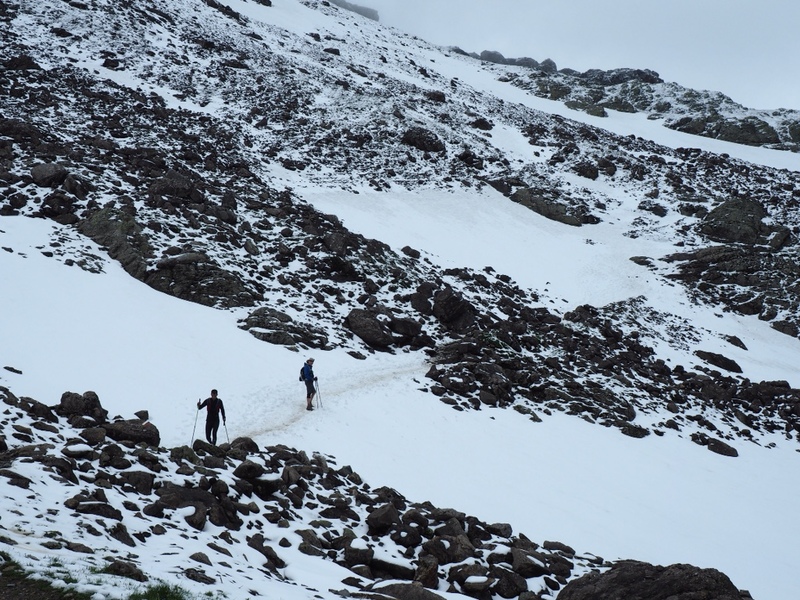 We walked across snow fields and hung on to railings and chains as our feet made their way on rocky ledges. Most of the way, each step had to be measured. The skies held their moisture most of the way, but there were a few episodes of icy rain and we finished with an hour of rain. 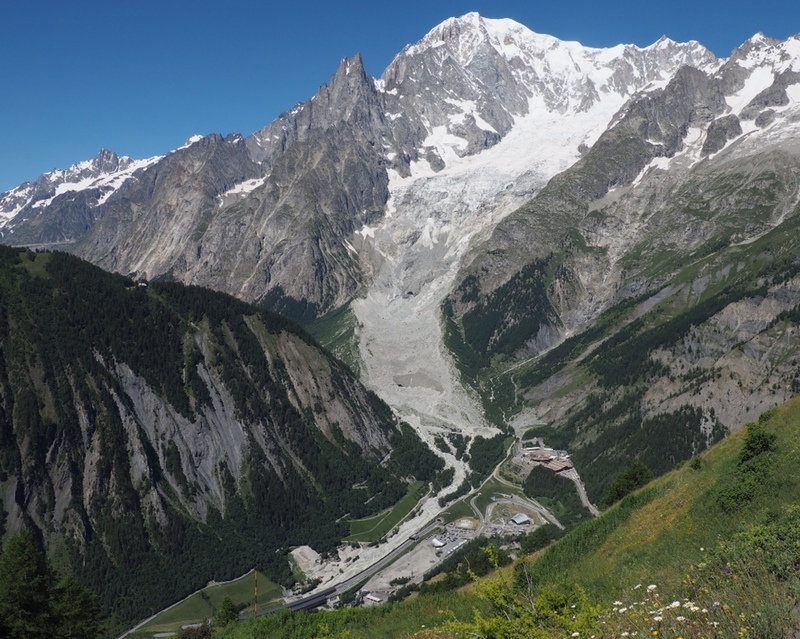 We arrived at our hotel after seven hours, exhausted but filled with vivid memories of our first day on the Tour du Mont Blanc. We shall see if we can walk when Day Two begins! 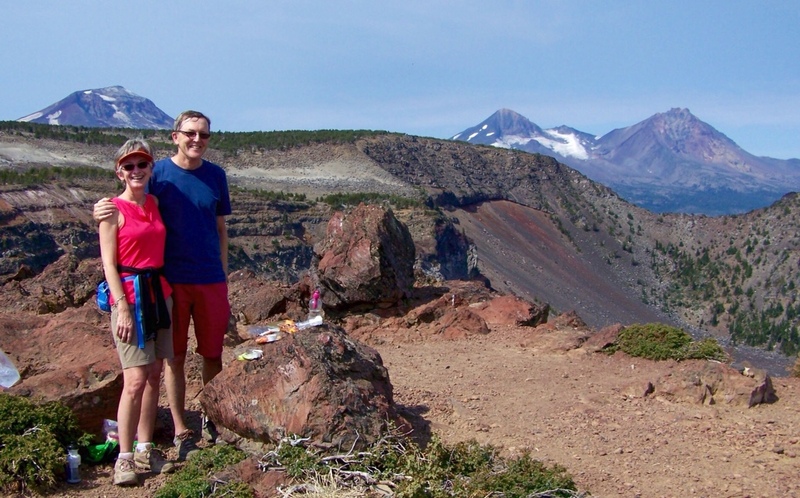 The Tam McArthur Rim trek ends with a view of the Three Sisters for a perfect picnic spot. “Like scoops in the world's largest sundae,” the Three Sisters “are served up as the centerpiece of the state's most visited wilderness,” writes William L. Sullivan. 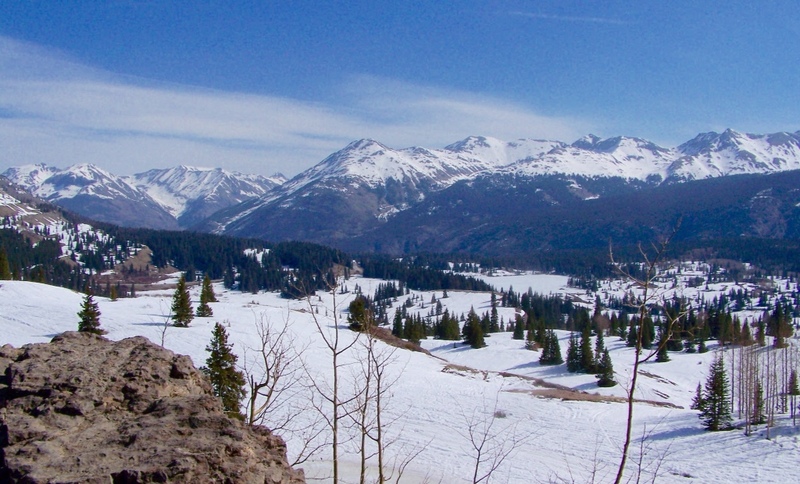 The top of the trail is just to the right of center, above Three Creek Lake. Just west of Bend, Oregon, the three 10,000-foot peaks and many lakes offer a plethora of outdoor activities. Sullivan's book, Oregon Trips and Trails, highlights more than 30 pages of things to do in the area. After coffee in the Western-theme town of Sisters, we drove about 18 miles south to hike the Tam McArthur Rim, which offers a view of the three siblings from a plateau at about 7,800 feet. The trailhead is at Three Creek Lake, perched at more than 6,500 feet next to 500-foot cliffs. The last few miles of the drive are on a gravel road. You'll need a $5 Northwest Forest Pass, available at Forest Service offices and outdoor stores, to park. 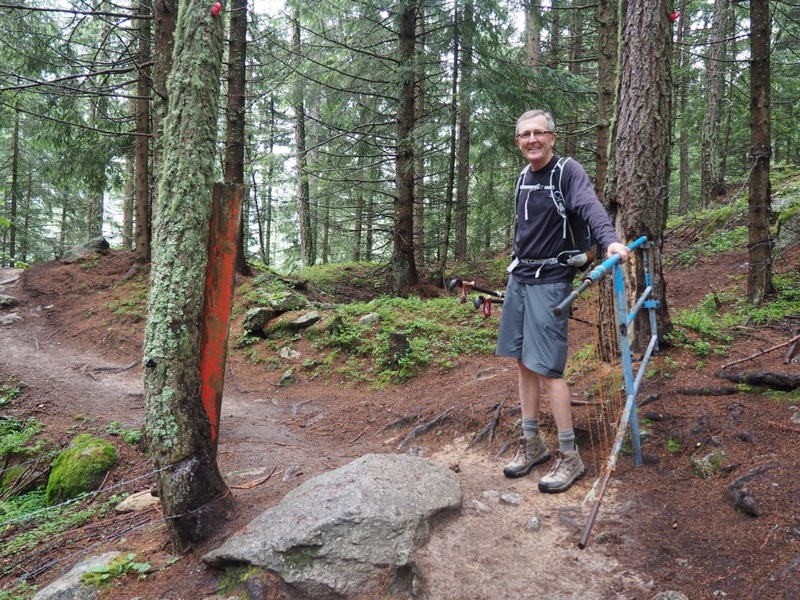 Sullivan rates the five-mile trek “difficult,” with more than 1,200 feet of elevation gain. There are some steep switchbacks, but the trail is clearly marked and the view from the end is worth every step. If you are campers, there are two picturesque National Forest campgrounds next to the lake, nestled in the trees. There were even a few small RVs that made the trip. One thing for sure: We will return to the area to enjoy more trekking and the city of Bend, which has a downtown full of character, excellent dining and three nearby mountains beckoning to come out and play. 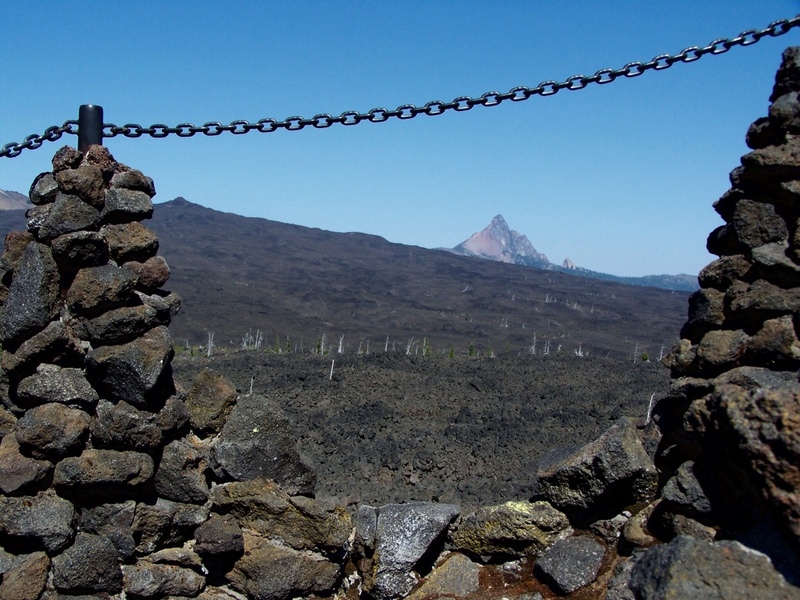 The Dee Wright Memorial Observatory tops McKenzie Pass on an old highway crossing lava fields near the Three Sisters. 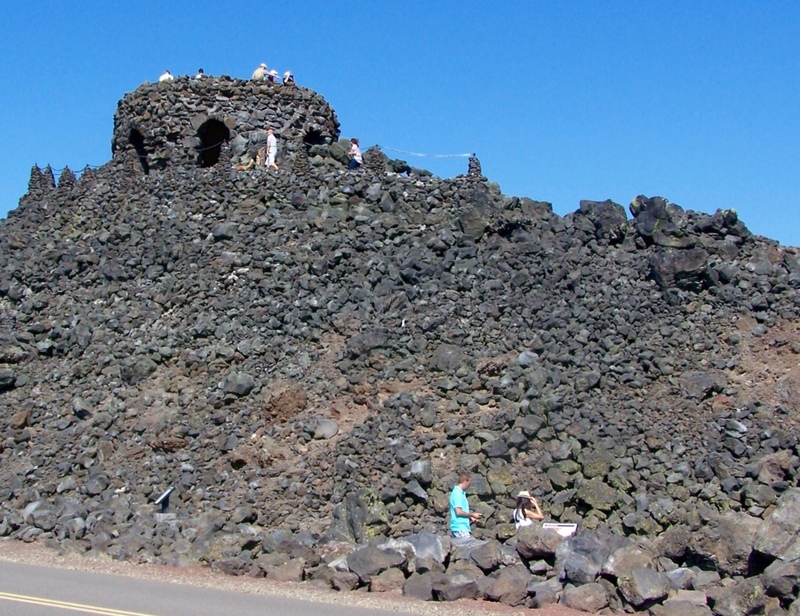 Mount Washington rises above more than 50 miles of lava beds. Travelers built a wagon road through the rock in 1877. What a beautiful surprise today has been. We're on the road again, driving towards our Park City, Utah destination where we will meet all our kids for a family reunion. In an effort to avoid the endless Nevada landscape, we chose the scenic route…through Idaho. On day two we headed north out of Boise following two lane Highway 21, climbing up into the mountains of Boise National Forest towards Sawtooth National Recreation Area. As we drove towards Stanley, Idaho for lunch, the Sawtooth Range cut into the horizon. 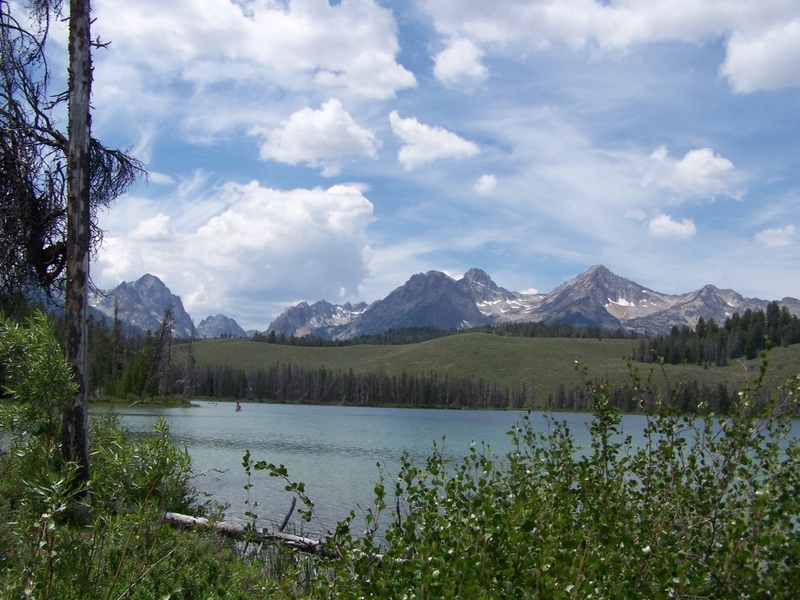 The Sawtooth Range provides a spectacular backdrop for Redfish Lake. Continuing on after lunch, we merged onto Highway 75, eager to see the resort towns of Sun Valley and Ketchum. We would have enjoyed wandering the streets of this picturesque enclave, however lodging was booked up and it was getting late. When the skies opened up, dumping rain in buckets, we decided to drive on to Twin Falls, Idaho for the night. 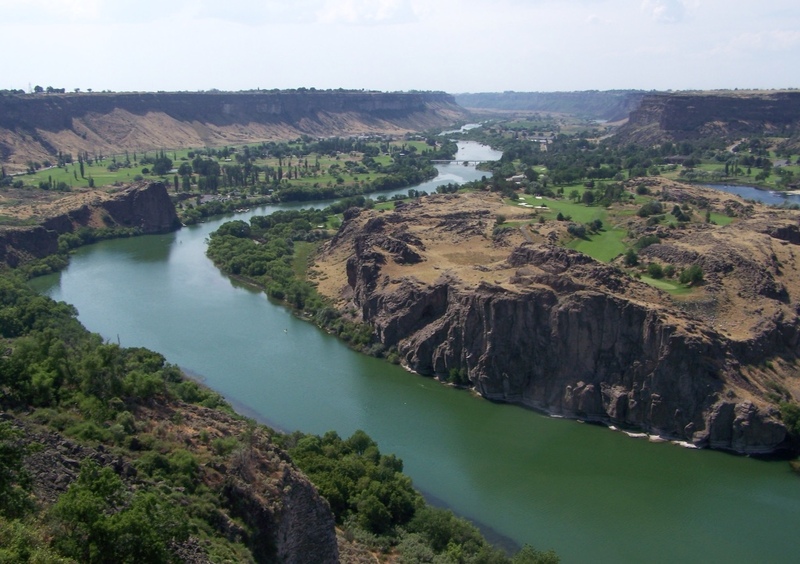 The Snake River winds its way below Twin Falls. You may remember it as the place where Evel Knievel attempted (but failed) to jump the Snake River on his rocket propelled motorcycle back in 1974. 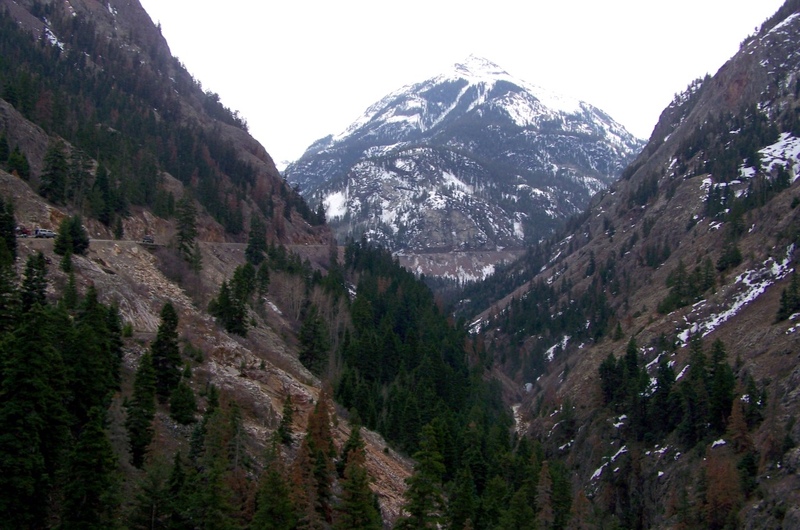 Highway 550 connects Durango to Silverton, paralleling the famed narrow gauge railway. You may have trouble imagining a Toyota Prius as a roller-coaster car, but that’s how it felt today. It took us over passes topping 11,000 feet, through tunnels covered with rocks and ice, and within a few feet of sheer drop offs at dizzying heights. Guard rails? Nah. Sweaty palms and white knuckles? For sure. 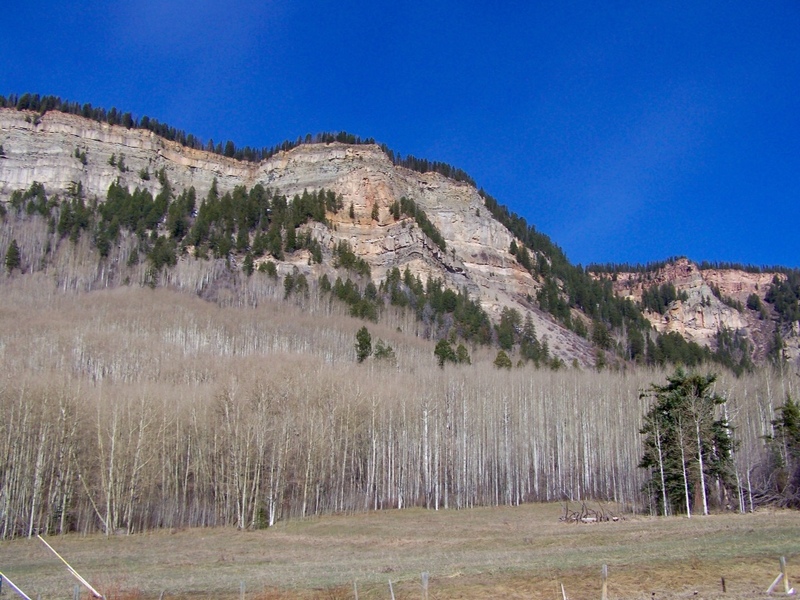 We were surrounded by peaks of more than 14,000 feet in southwestern Colorado’s San Juan Mountains as we traveled from Durango to Moab, Utah. A few other vehicles joined us for the ride. Spring has not yet struck this aspen forest near Durango. 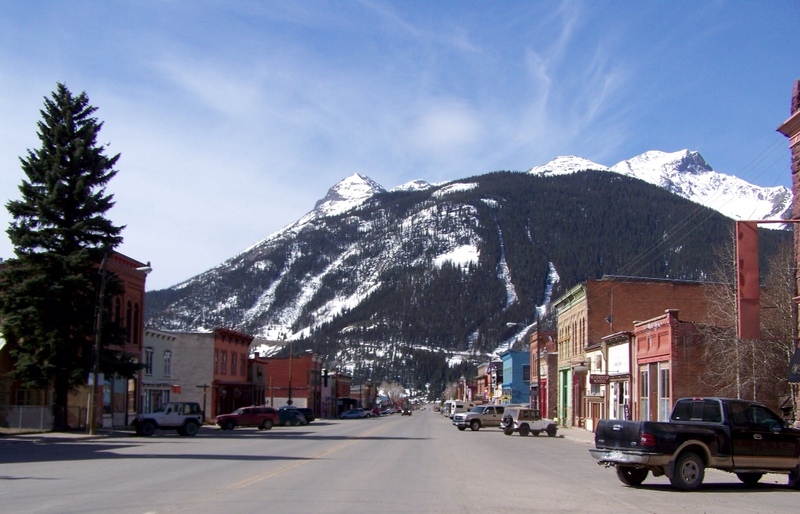 We stopped for coffee in the old mining town of Silverton, at more than 9,500 feet. Look closely to see the narrow road descending from an 11,000-foot pass.